Jessie's blog, to the right, introduced me to this concept. 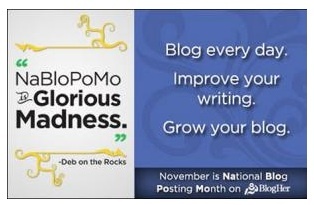 It goes along with NaNoWriMo, National Novel Writing Month. The whole concept of NaNoWriMo is to get people writing. You have a set number of words you are to write during the month. You're not to go back and edit. You're just supposed to write. Carole participated in this several years ago. She said there were days it was really hard to crank out anywhere close to the needed words in order to make the final total. I've thought of participating but that's as far as it goes. I saw this badge on Jessie's blog so I headed over to BlogHer to check it out. This is not a 'churn out 13,000 words a day' thing. This is just an attempt to get women bloggers to write every day. I think I registered my little blog. I found the registration form very confusing. My goal, every month, is to have a post a day. Now that can take the form of, as it is today, a mass of posts that equal the day count, or it can be a post a day if I find I have something I think is interesting to relate. You look at months like June, with a great number of weddings to blog about, and August with a great number of things to talk about, I easily can get close to 2 blog posts per day. It's the 12th today. I'm behind due to the cold. Stringing words into sentences and sentences into paragraphs is rather hard work when your brain is filled with cold fog. Heck, I'm having more of the "why did I come into this room?" moments because of the cold than normal. Write something coherent. I think I'll pass. Still, this is a grand idea. I don't expect my space in cyberspace is going to attract any more visitors than it currently does, but the concept is nice. If you're new here, welcome. If you're an old friend, welcome back. "30 days hath November..." and there will be a post for each one.